This is one of a large collection of architectural views acquired by the Victoria and Albert Museum Art Library from Professor Sir K.A.C. Creswell (1879-1974) between 1921 and 1939. The majority of the views are of Cairo, but the collection also includes views of Palestine, Jerusalam, Syria, Jordan, Iraq, Constantinople and Tunisia. Creswell is considered the eminent pioneer in the scholarship of medieval Islamic architectural history. Among his publications, Early Muslim Architecture (vol. 1, 1932 & vol. 2, 1940) and Muslim Architecture of Egypt (vol. 1, 1952 & vol. 2, 1959) remain basic research tools for scholars of medieval Islamic architecture. Creswell has been credited with bringing a level of scholarship and quality to the field. Prior to Creswell's work, archaeological fieldwork consisted of drawing a reconstruction of the original plan of a monument. Creswell considered photography an essential part of recording the physical evidence. He took and printed his own photographs and paid attention to their quality. Creswell started taking his own photographs at least as early as 1916 as views were published and credited to Creswell in the 1917 Cairo travel guide, Rambles in Cairo written by Henriette Devonshire. A few of the V&A’s views overlap with those published in Devonshire’s guide, but the fieldwork Creswell undertook for his books was most likely the source of the photographs that he sold to the Museum. Many of the buildings which Creswell photographed are no longer extant, others may have been significantly changed through later restoration or adaptation. These photographs therefore provide an invaluable record for those interested in the history of the major monuments of the Islamic Middle East. The first record of correspondence between K.A.C. Creswell and the Victoria and Albert Museum dates from 15 February 1916. It relates to Creswell's article 'The History and Evolution of the Dome in Persia', an illustrated monograph he presented to the Library. Some four years later, Creswell approached the V&A concerning his collection of photographs. In a letter dated 15 September 1920, two months after Creswell was demobilized from the Army - having served in Egypt, Syria, Jordan and Palestine, including a posting as Inspector of Monuments of Occupied Enemy Territory - Creswell wrote to G.H. Palmer of the Museum's Art Library offering a set of ‘about 2600 architectural photographs’ of Islamic architecture, printed on Velox paper. Included with the correspondence were 16 specimen photographs. Noting Creswell's expertise in the subject and his 'special opportunities to take photographs', Palmer endorsed the purchase and the Library confirmed the order on 26 November 1920. This suggests that the V&A was the first public collection to acquire Creswell's photographs. Creswell was known to collect views by other photographers working in the region. 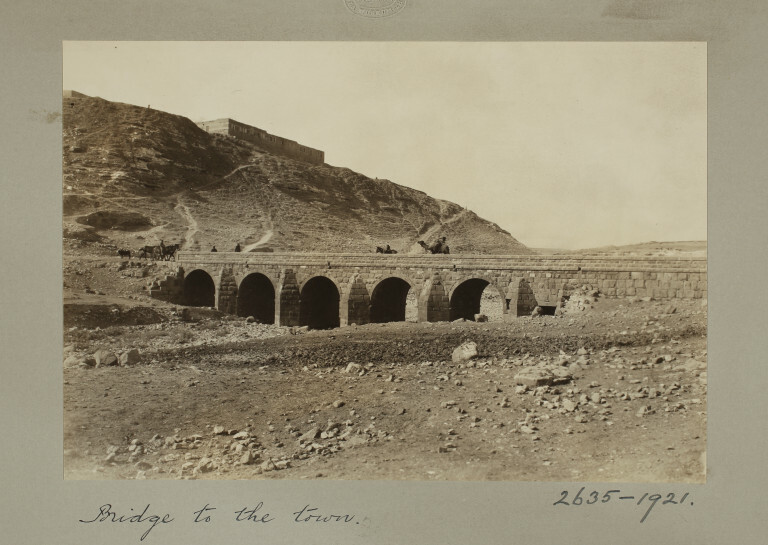 According to the historian Ritchie Thomas, the Armernian photographer G. Lekegian made many photographs for Creswell and he considered him a ‘personal’ friend.1 But correspondence in the archives relating specifically to the Egyptian views indicates that these were taken by Creswell himself. Creswell wrote: ‘This series was taken to supplement a large number of photographs the Museum had purchased from Lekegian, and will not duplicate the photographs in the S. Kens. Mus. many of which were taken by Lekegian'.2 Creswell started taking his own photographs at least as early as 1916, as they were published and credited to Creswell in a 1917 Cairo travel guide. Shortly after his offer to the V&A, Creswell departed for Cairo in order to begin his monumental book project on Muslim architecture under the patronage of King Fuad of Egypt. This would explain Creswell's stipulation as part of the purchase expressly limiting the V&A's reproduction of these views pending the publication of his book. The order was filled in 14 batches sent to the V&A from Cairo beginning 14 January 1921. The last batch was received at the Museum on 26 April 1921. This first order totalled 2612 photographs delivered by Creswell to the V&A (not including the original 16 specimens). 1Richie Thomas, ‘Some 19th Century Photographers in Syria, Palestine and Egypt’, The History of Photography, 3, no. 2 (April 1979): 157-166. 2Notes on photography collection included in letter from Creswell to G.H. Palmer 12 September 1920, V&A Archive of Architecture and Design AAD/MA/1/C3193. 3Letter from Creswell to Bernard Berenson 5 February 1931, The Berenson Archive, Villa I Tatti, The Harvard Center for Italian Renaissance Studies, Florence, Italy. Creswell, K.A.C. Early Muslim Architecture. Vol. I Umayyads and Vol. II Early Abbasids, Umayyads of Cordova, Aghlabids, Tulunids and Samanids. Oxford: The Clarendon Press, 1932-40. Creswell, K.A.C. The Muslim Architecture of Egypt. Vol. I Ikhshids and Fatimids and Vol. II Ayyubids and Early Bahrite Mamluks. Oxford: Clarendon Press, 1952-1959. Hamilton, R W. Keppel Archibald Cameron Creswell, 1879-1974. In Muqarnas VIII: An Annual on Islamic Art and Architecture, edited by Oleg Grabar. Leiden: E.J. Brill, 1991.